Through all the history of our Catholic faith, physical buildings to worship our Lord, have come and gone. Our faith and our Lord Jesus Christ remain. 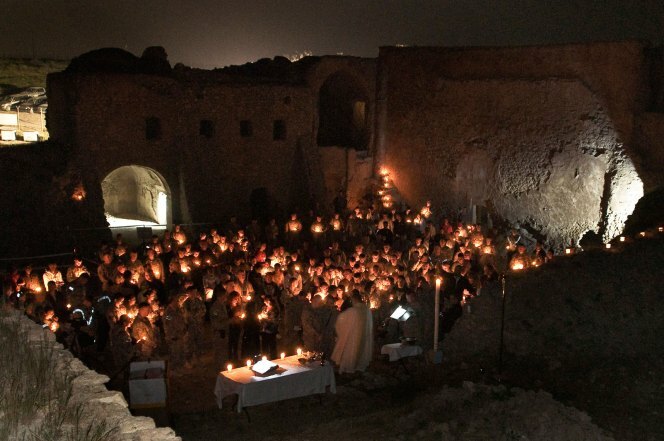 The physical building of St. Elijah’s Monastery of Mosul may no longer stand, but we do in Jesus Christ and with Jesus Christ. One day, in His time, God willing, worship of our Lord may resume in that exact spot, just as it has time and time again through all the world, time and time again. In listening to Bishop Robert Barron’s podcast Homily for this weekend, as Catholics, we are called to remember where we came from. We are to never forget that it is our Lord who has built the wall and is the bridge in our faith. Remember that not only was are Lord persecuted and put to death but He also resurrected! Thank you Pondering Peg! These are just the words I needed to read today!